If you're rushing out right now to look at a piano, scroll halfway down the page to the Checklist, which will help you assess it. Otherwise, read on at a more leisurely pace for lots of information and suggestions about purchasing secondhand. Please note: I'm not a piano dealer and I don't buy secondhand pianos. When someone is starting lessons, buying a brand new piano straight away is an expensive option. Realistically, many will begin with a secondhand piano. What's the best way to obtain a good secondhand piano? Probably there isn't one single "best way". On this page we'll consider various approaches. Information here is based on my experience and opinions, and is offered without liability. The good news is that in recent years secondhand piano prices have fallen substantially, so there's never been a better time to buy. You can pick up a quality instrument at a great price! But just as with a used car, you need to think: AGE, MILEAGE and SERVICE HISTORY. Don't buy one that's ancient and/or has been played until it's completely worn out and/or has not been properly maintained. We'll focus more on upright pianos, as they are much the more popular choice in the UK. In the USA the balance is different. But the buying checklist applies just as much for grands, and some comments specific to grand pianos are included at the bottom of the page. It's usually nice to be given something for nothing! But moving a piano is costly, so first find out if it's worth it. Many piano technicians offer a service to inspect a piano and give advice. Sometimes a worthless old piano is offered for free just to save the cost of disposal. But that's not always the case. 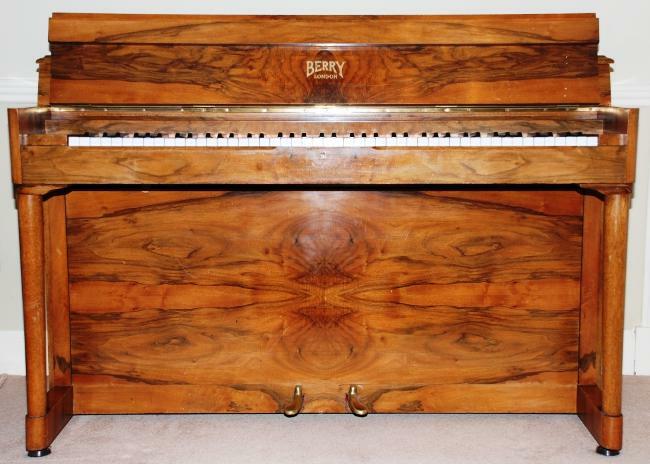 The piano at the top of this page is a fine quality old upright, given as a gift to the family who own it. It's well over a hundred years old, certainly in its twilight and not a candidate for major restoration. But a nice old instrument just the same, still musical. And a while ago I visited a family who were given the large grand piano in the front parlour by the lady from whom they bought the house. She was downsizing and couldn't make room for it in her new home. An advantage of buying privately is that you can sometimes pick up a great bargain. But remember - people may be offering a low price because the piano is so poor that no piano dealer is interested. Nowadays there is the option of online auction websites. But if you're serious about the piano, I really don't recommend buying a piano without trying it out first. So, keep in mind that while a private sale CAN be a good way to pick up a bargain, there are factors to consider. Some may dislike the idea of buying from a shop, feeling that they could get a better bargain by private sale. Maybe, but retailers provide added value in terms of advice and after-sales service. Before selling a secondhand piano, a reputable dealer may have had to carry out a lot of work on it. And unlike a private seller, where it's more or less "caveat emptor", a retailer has a weight of legal obligation, and will be jealous of his good name. A shop-bought piano comes with some degree of assurance, probably including a warranty. And after all, if a retailer tried to charge outrageous prices, stock simply wouldn't sell. Pianos do turn up in charity shops and depots. But they often end up there because they're of no value. It can be worth having a look, though. Perhaps the exterior looks very tired but the piano is otherwise reasonable and if you have wood finishing skills you could turn it into something respectable. Again, you can get your piano tuner and technician to check it for you. If the piano has a Birdcage action, it's likely also to be straight strung rather than overstrung. You can observe by removing the bottom panel, usually secured at its top by a latch at each end or one in the middle. Do all the strings go straight up and down, parallel to each other? Or do the bass strings cross diagonally over the treble strings? 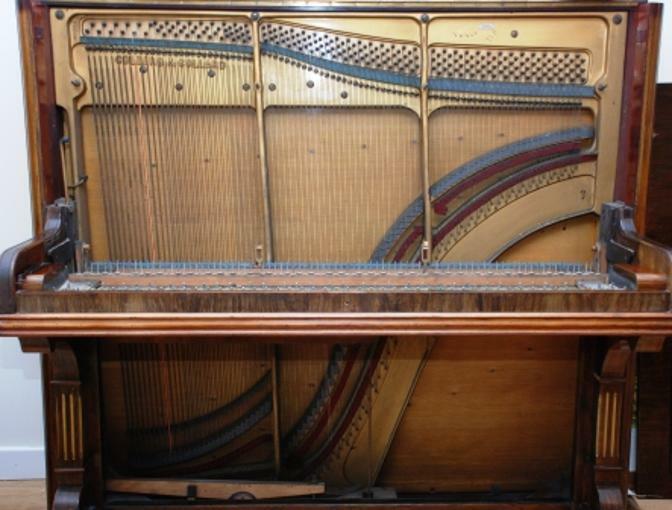 The photo below shows a straight strung piano with keys removed (this particular instrument is a high quality Collard & Collard with underdamper action, not a Birdcage piano). If the piano is of the straight strung Birdcage type, then it was a budget piano when new, and it isn't worth much, if anything. Still, some such pianos can turn out to be in reasonable condition, and in my opinion, an adequate Birdcage piano from the later era of their production - late 1940s to early 1950s - is still preferable to a Digital Piano for starting lessons. (See the digital keyboards page of this site for more information). My general advice however, is not to buy a birdcage piano. Another thing to check, although looking can only give you limited information, is the condition of the Wrest Plank where the tuning pins go in. 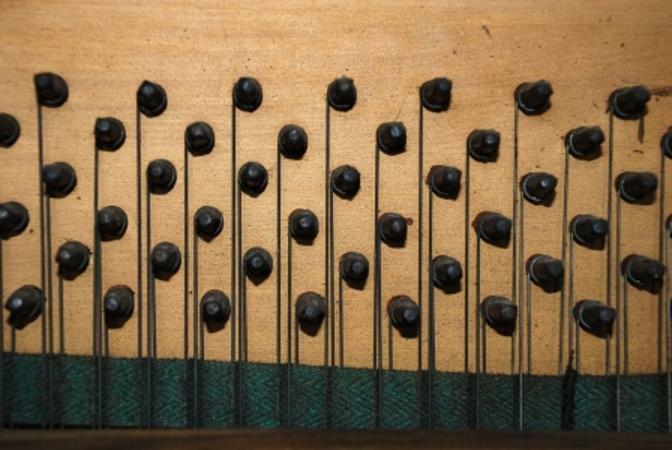 If it's an open-face wrest plank, as many Birdcage pianos were (not covered by a cast iron plate with tuning pin holes), does the surface of the wood look unbroken, or can you see cracks running vertically between the tuning pins? 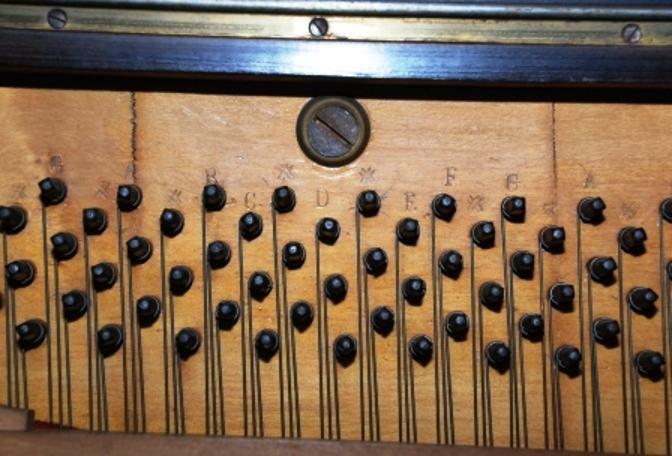 The photo below shows the wrest plank of a birdcage piano that was in a charity shop. It looks OK and in fact the tuning pins were nice and tight. It's vital that the tuning pins are tight, and really only the Piano Tuner can tell you if they are. If the piano sounds desperately, wildly out of tune, with some notes much worse than others, this may be a sign of very loose tuning pins. Splits like the ones below in the wrest plank of an old piano are not a good sign. Sometimes they only affect the surface layer and aren't structurally significant, but they are a cause for concern and something to look out for. 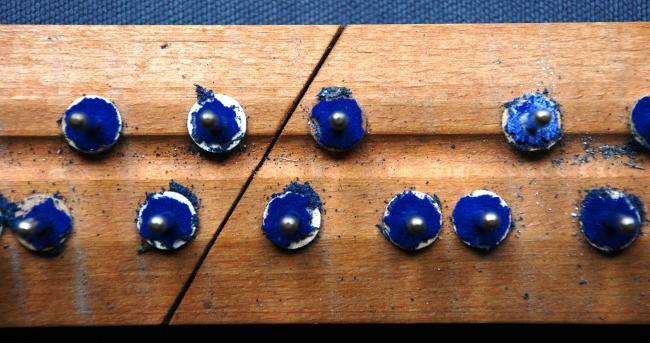 The tuning pins in this piano were too loose for it to worth even attempting a tuning. 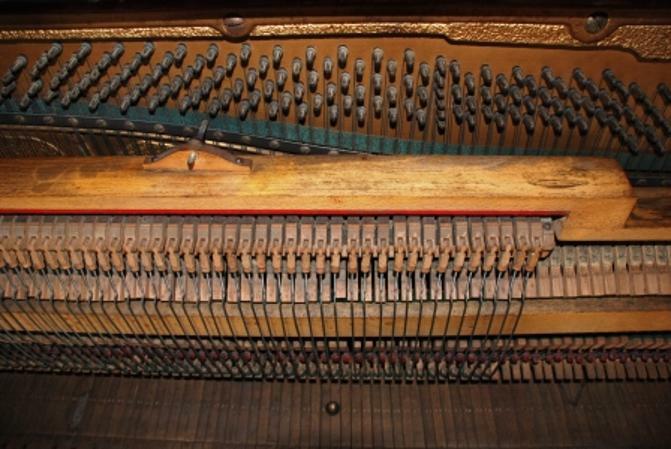 There are remedies for loose tuning pins, but the piano has to be worth the expense. Here's another wrest plank with splits, one of which was quite deep into the plank. 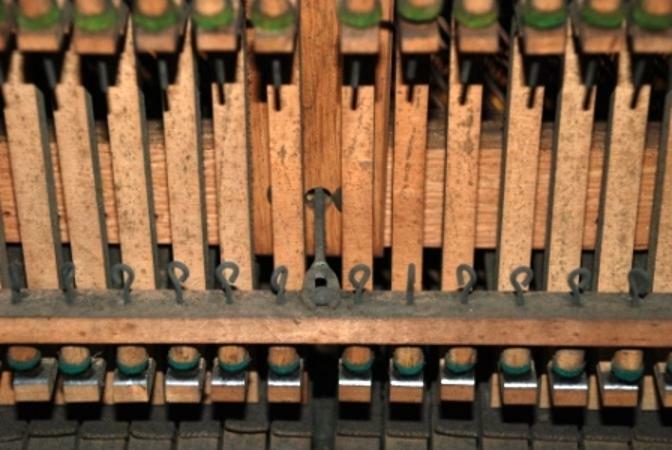 But the tuning pins were tight and the piano tuned up well, taking to a substantial pitch raise to bring it to concert pitch (actually A435, probably its original pitch). 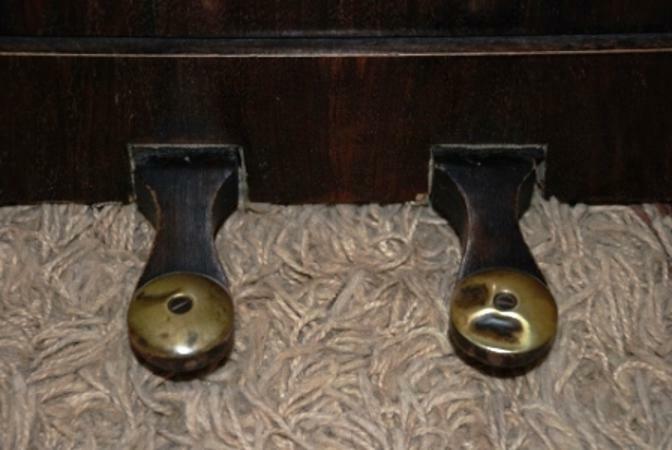 Pedals like those in the photo below - wood with round brass caps - indicate a really old English piano, absolutely valueless and to be avoided. 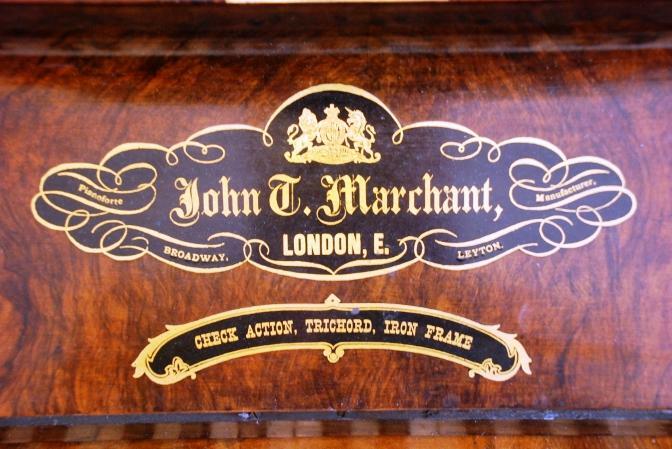 Another sign of a piano to avoid, is a black and gold transfer on the Fall (keyboard lid) or on the keyslip rail (just at the back of the keys) that says something like Upright Iron Grand or Full Trichord Check Action. These transfers were put on cheap pianos in the 1880s and 1890s to make them seem more impressive. If you see one you know the piano is very old and was low-grade even when new. These pianos are often of the Spring & Loop action type. See the birdcage pianos page for more information. The actions weren't good even when new, and are now very brittle. If you're able to take the front panel (called the Top Door) off, you can tell a Spring & Loop action easily from the rail with the set-off screws at the front of the action just above the keys. In other actions this rail is further inside the mechanism. Don't get - even as a gift - a piano with a Spring & Loop action; they really are well beyond the pale now. The set-off rail, clearly visible in these two photos. This is what you see at the front of Spring & Loop actions. Avoid. In the 1950s there was a fashion for "modernising" 19th century Birdcage pianos. Some of these are still around, and look younger than they are. it's important to be aware of this. Please read the section on Modernised Birdcage Pianos on the Birdcage Pianos page of this site, where there are illustrative photos. 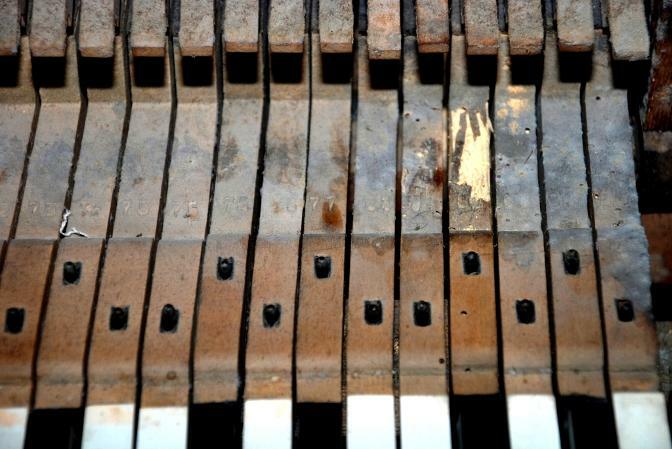 The work done in 'modernising' was purely cosmetic, and disguises the age and true condition of really old cheap pianos. 1) Do all the keys play? Do they go down smoothly and come up promptly, and does the note sound for each key? Does the note sound every time, even when you play the key repeatedly and quickly? 2) How do the key coverings look - are they very dirty, discoloured or chipped/broken? Are some missing? 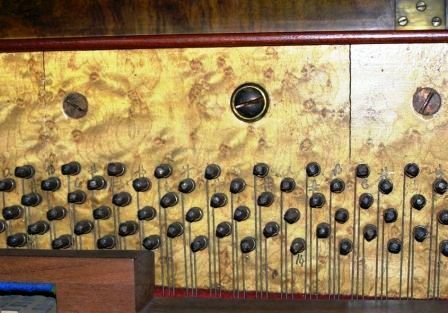 3) If you can, examine the soundboard - the large flat wooden panel behind the strings (underneath them in a grand). 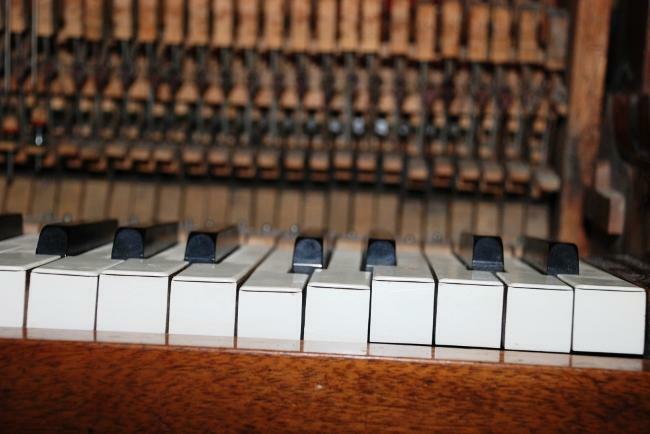 In the upright piano, remove the bottom panel under the keys to look at the soundboard, and if the back of the piano doesn't have a cloth cover, check the soundboard from behind. Are there any splits? Splits in the soundboard might be problematical. 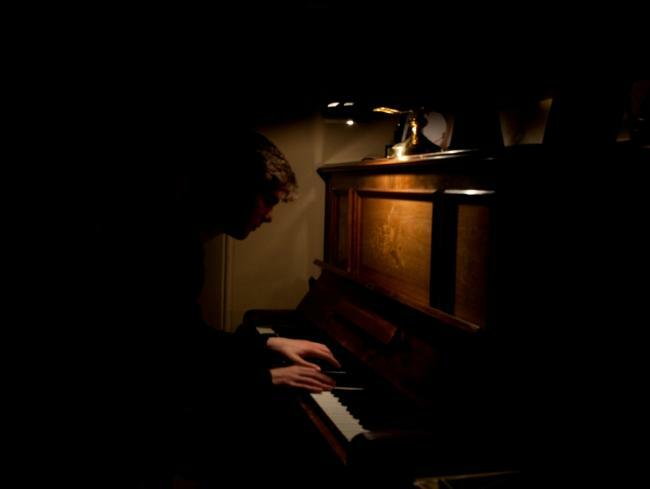 4) Are there bad rattles or buzzes when you play the piano? 5) Do the bass notes sound much quieter than the rest? (may be detached bass bridge). 6) Do both of the pedals work? Do they make a lot of noise, creaking or squeaking? 7) Take a pitch reference of some sort with you - a smartphone app, tuning fork, guitar tuner or even pitch pipes, to check if the piano is at concert pitch, or far below it. 8) Look very carefully around the casework for any sign of woodworm holes (see photos at the bottom of this page). 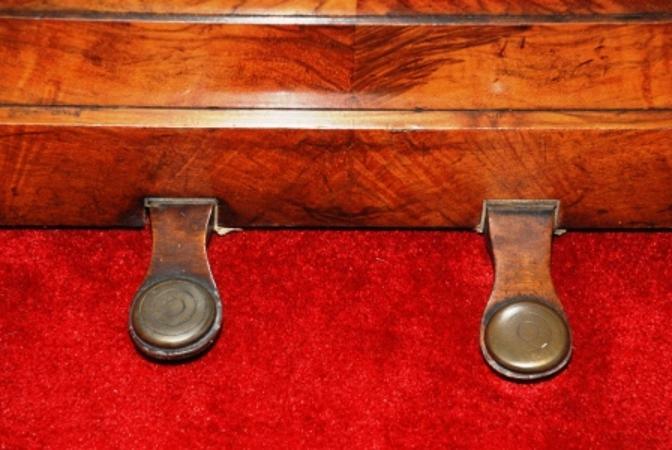 It's especially helpful if you can take out a key or two to look at the undersides, where the wood is clean and it's easy to see the little holes. 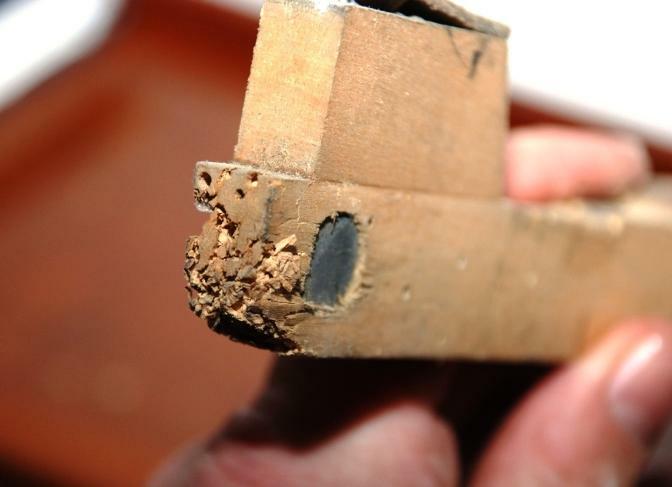 If there are signs of clean looking wood powder near tiny holes, or if powder falls out when you tap a key against a hard surface, that's a strong indicator of active woodworm. See further down this page for photos. 9) Examine the felt and cloth parts, including the hammers, for signs of moth damage (see photos at the bottom of this page). 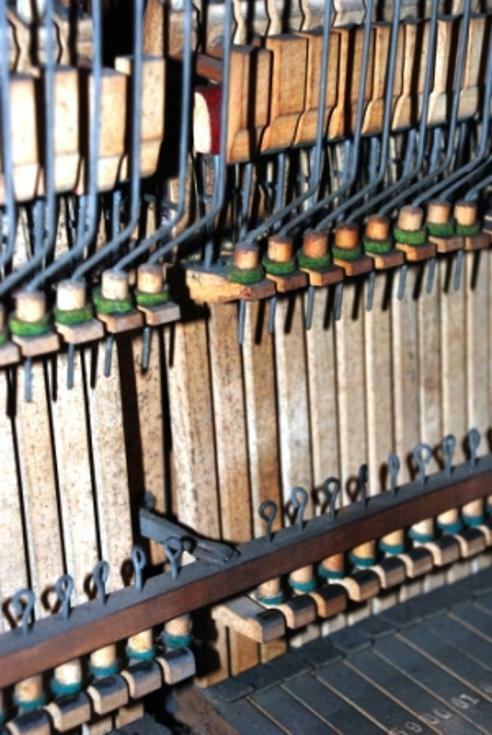 All the felt parts in pianos are made of wool. One season of severe moth infestation can completely ruin a piano; it happened to a client of mine (it's not actually the moths that consume the cloth and felt - it's their tiny larvae). Check also for any sign of other insects. Someone recently reported in an online forum that the secondhand piano they bought was infested with cockroaches (this wasn't in the UK). 10) Listen for how the dampers are working. Do some notes ring on even when you let the keys up? Does the piano sound as if ALL the notes are ringing on? This indicates a problem with the dampers - the felt pads which stop the strings from sounding. They may be hard and ineffective with age, or springs may be broken, or some other problem with the mechanism. 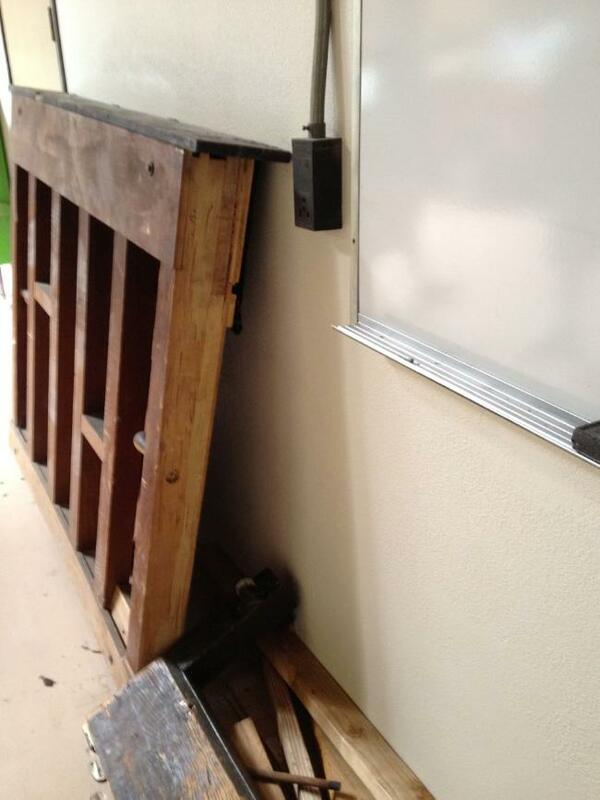 11) Assess the general condition of the casework - are there loose parts, a broken music desk, damaged hinges? What is the condition of the finish - does it look very 'distressed'? 12) How does it smell? There have been enquiries to online forums - and I've had some - about what to do with a secondhand piano just delivered, and discovered to stink of stale tobacco smoke or mildew. If you're shopping at the budget end of the market, remember that in a large charity depot an odour might not be very noticeable. But it could be unbearable in the confines of a modern centrally heated draught-excluded home. And it's a surprisingly difficult problem to fix. This sounds like a lot of things to check. But it needn't take very long, and can help avoid a costly mistake. So far we've concentrated on the "bargain basement" end of the market. If the budget is more generous - and if you are serious about music then really it should be - a good quality younger instrument, perhaps ten to thirty years old, can give decades of service. These don't turn up in charity shops. Since a piano in normal use will last a lifetime, the reasons for getting rid of one that's only ten years old are few. Some do become available though; maybe an advanced music student is upgrading, or a family member has moved away. Such instruments are probably best found in piano shops. Some appear on auction sites, but remember the comments earlier about buying without trying. If the budget is large enough for a fairly young secondhand instrument, it's worth spending time trying lots of pianos in showrooms and getting advice from the retailers. It's important to try quite a few, so that you find one that has the tonal quality and the touch that really suits you. Although these mini pianos have very short strings and very small soundboards, they can sound OK for their size. But my advice is not to buy one. The problem is the 'buried' action. Normally it takes only seconds to take the action out of an upright piano to fix a problem, and seconds to put it back again. But with these dropped-action mini pianos, there can be hours of work just in removing and replacing the action. These pianos are now fifty to sixty years old, and therefore of an age when things WILL start going wrong. And repair simply isn't worth it. If you're contemplating a grand piano, you really do need to get technical advice locally before you buy, especially if you're looking at pianos in auction rooms, charity depots, or online. b) D-Type Spring & Loop actions. Many of the smallest grand pianos have this cut-down type of action, to save space and costs. They are a simplified version of the grand piano action, and in my experience never feel good. With extensive regulating no doubt they could be improved, but the pianos are generally not worth it. c) Very small grand pianos have shorter strings and a smaller soundboard than a good large upright piano. They may look elegant in a room, but they just don't sound good or feel nice to play. 2) Buying very old: Pianos wear out! You can find large old grand pianos at quite low prices nowadays. But while a big grand piano might LOOK very nice, it may have had no regulation in more than a hundred years and have loose tuning pins, grossly worn hammers, and a multitude of other faults. The chances are high that the soundboard will have lost much of its 'crown', and every felt and cloth part in the action may be worn away. This is not to say that bargains can't be had - they certainly can. But if you are not buying from an established retailer who will give you good advice and some kind of warranty and after-sales service, then you do really need to get a prospective purchase checked over before buying. Even then, a technician can't give any absolute guarantee that some serious problem might not subsequently appear in an old instrument. It can be tempting if you see a very old large grand piano at a low price, to think in terms of restoration. But good quality restoration of a piano (not just a lick of polyester on the case to freshen the appearance) is extremely labour-intensive - more so than new manufacture - and therefore very expensive. You can't normally expect much from a £50 or £100 piano - or from a free one. The analogy of a secondhand car might help: Maybe an elderly relative stops driving due to health problems, and gives their fairly new car to a young family member who has just passed the driving test. That's a generous gift and a happy scenario. But, how often would you ever see an offer of a free car from a stranger? Similarly, fine pianos do occasionally get given away for various reasons. But people don't give away good quality pianos in excellent condition to strangers. If you see a used car advertised for £50 or £100, what sort of car do you think it will be? If you pay that amount for a piano, generally you get the piano equivalent of the car you'd get for that money! It's frustrating how often people have lovely modern homes, expensive high-grade new cars, and a house full of new premium quality appliances, yet seem to expect a century-old piano to suffice. Pianos are machines as well as musical instruments. Machines wear out. How old is your vacuum cleaner? Your washing machine? Your car? How much did you pay for them? Be realistic about old pianos, and what you can expect for a low price. 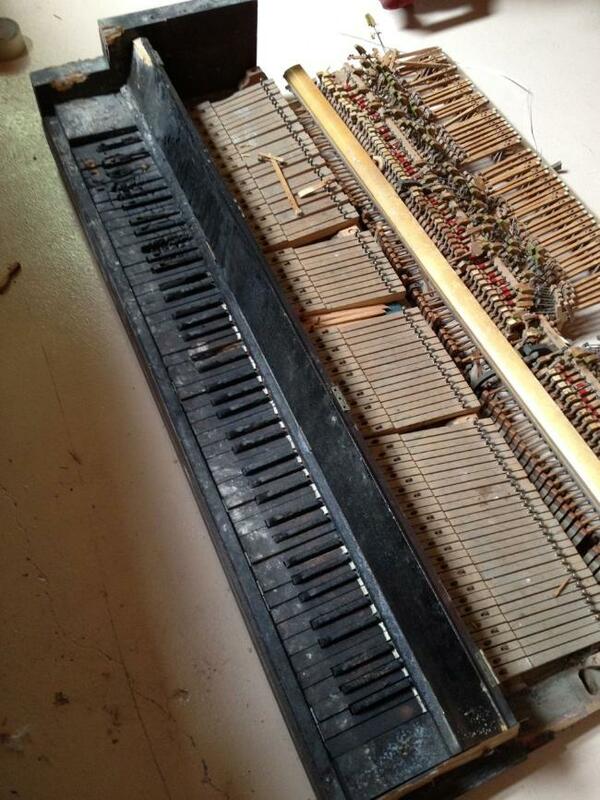 For points 8) and 9) of the Checklist, here are photos that may help when looking over an older piano.